Do you know the countries, capitals and flags of this world? It is likely that you can find your country on a world map but what about countries like Costa Rica, Qatar or Mozambique? And when you thought that was hard, how about naming the capitals of those countries, or describing at their their flags? 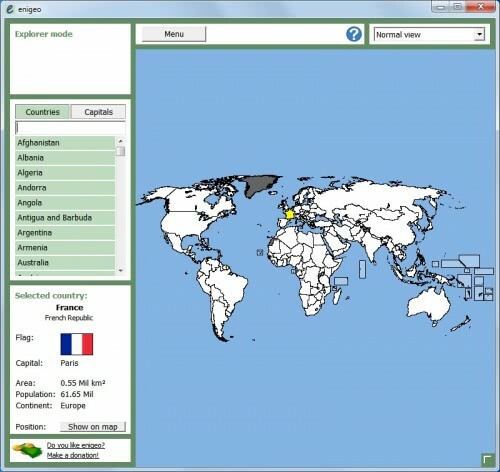 Enigeo is a free geography quiz for the Windows operating system that teaches geography. It offers a geographic quiz and an exploration mode. The quiz is highly customizable, as users can combine a list of countries and continents with the four different question types map, country, flag and capital. These question types can be combined, it is for instance possible to create a quiz that only asks about country capitals, one that asks the user to identify countries by flag, or to find a specific country on the world map. The same is true for the country and continent selection. You could for instance limit the quiz to Europe, Asia or another continent to concentrate on this particular topic. The program loads a new screen when the quiz starts. The window displays a world map with options to zoom in and out with the mouse wheel, and to scroll around by holding down the right mouse button while moving the mouse. The current question is displayed on the top left. Depending on the type of question the user either has to select a country on the world map, or pick an answer from the left sidebar. This is for instance used to identify country flags and capitals. Facts about the last answer are displayed, including the country, flag, capital, continent and population. There is also an option to show on map, which is helpful to locate the country properly on the world map. Results are displayed in the end detailing the correct answers, the time it took to answer each question and detailed stats about the type of question and answers per continent. Explorer mode is the second mode that Enigeo offers. It basically allows the user to interact with the world map and countries / capital listings to retrieve information directly. It is for instance possible to point the mouse on a country on the world map to display information about that country. Enigeo is a portable software for Windows. It is available in seven different languages and compatible with all Windows versions from Windows 2000 to Windows 7. Thanks Martin. I like learning about the different countries of the world and this seems to be the perfect program for that. Great find. I have been using this for a few months, it’s a great alternative to the awesome KGeography for Linux.